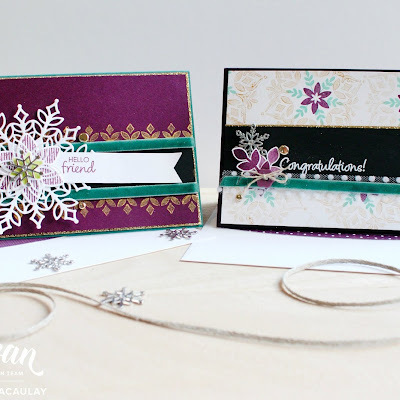 Hello there and welcome to another Artisan Design Team blog hop. Today we are once again featuring the Colour You Season suite of limited edition products. 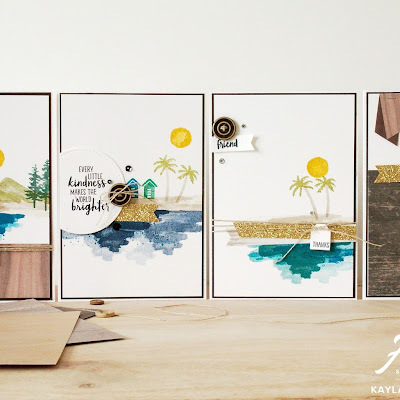 These products are AMAZING and such a cool limited edition release for Stampin' Up! to provide us with. 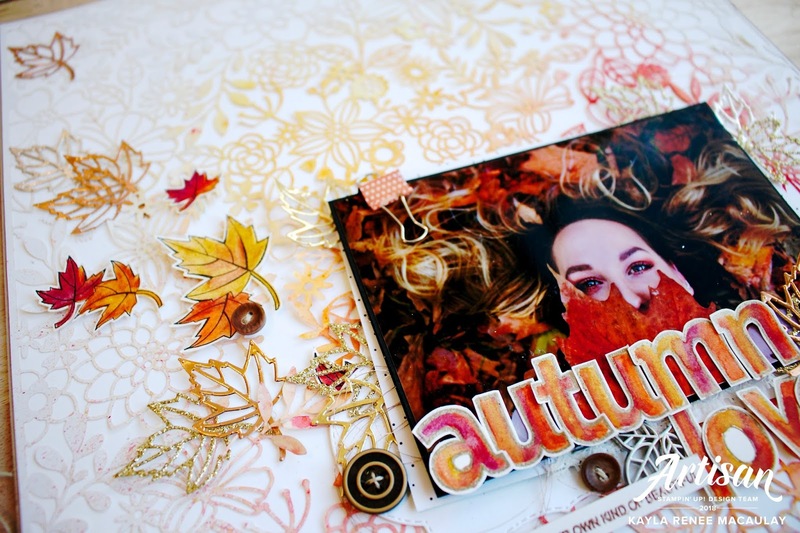 Today I have created a scrapbook page and some cards based around an Autumn/Fall theme (you could use these products to create projects for any season!) I hope you enjoy what I have created today and be sure to check out the bottom of the post for links to all the other gorgeous Artisan blogs and all the products I have used. Be sure to order your own of these gorgeous products as they are strictly while supplies last! My first project was a 12x12 scrapbook page. I will be honest and admit that I haven't scrapbooked in a long time! I am actually a traditional scrapbooker at heart. I started with scrapbooking many moons ago at the age of fourteen (now almost twenty eight) and I loved it and scrapbooked for many years. I think I have found the love again for it now that life has settled down a bit. 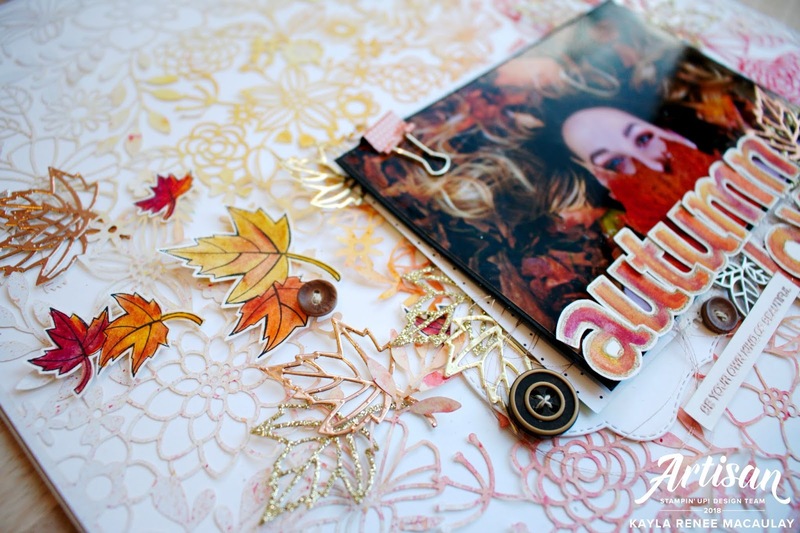 When I realised I was creating Autumn projects I knew that I had the perfect picture to scrapbook. This is my little sister recently here in Tasmania, Australia where we had beautiful Autumn colours. I am a total lover of Autumn, it is definitely my favourite season. 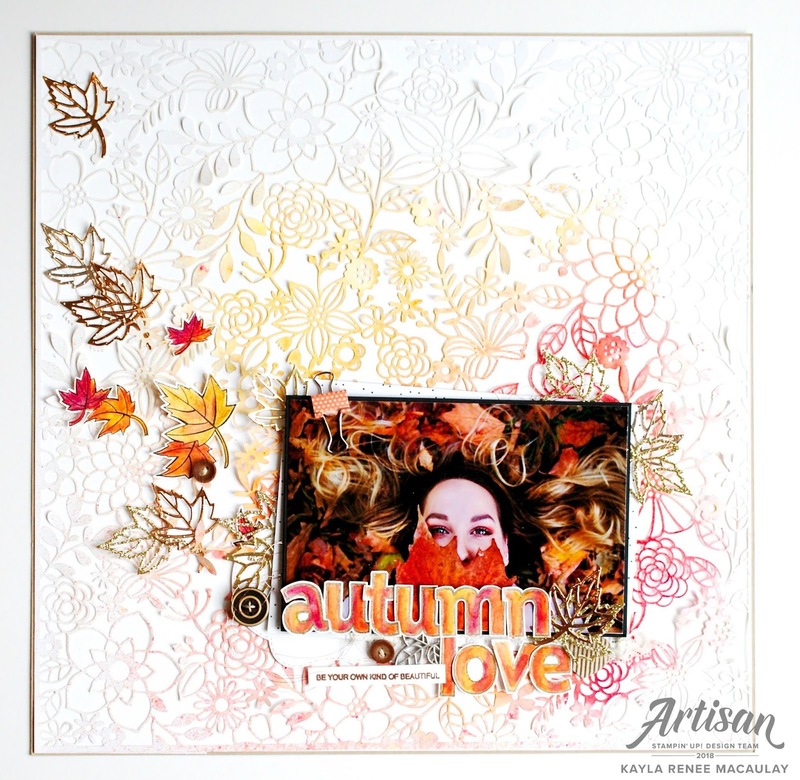 I started the page with the gorgeous Delightfully Detailed Laser Cut Paper which I then coloured in Autumn colours with the lovely warm tones of the Brusho Crystal Colour. I wasn't shy with spritzing it with water and then sprinkled the Brusho on top. I love how it turned out. I then mounted it on Whisper White 12x12 cardstock and then finished it off by mounting it on Crumb Cake cardstock. 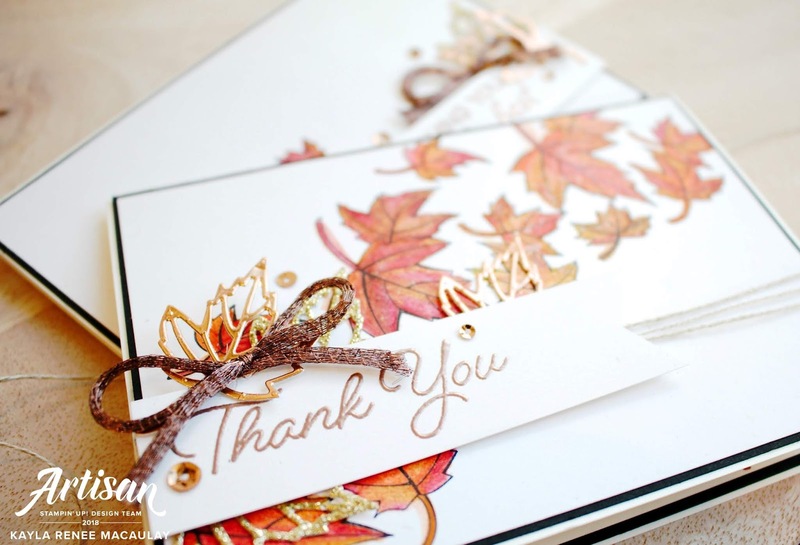 To tie it in with these gorgeous Colour Your Season products I used the beautiful leaf die to cut some gorgeous Autumn leaves with Gold Glimmer, Copper Foil, Gold Foil and Champagne Foil. I love how they looked in the various colours. 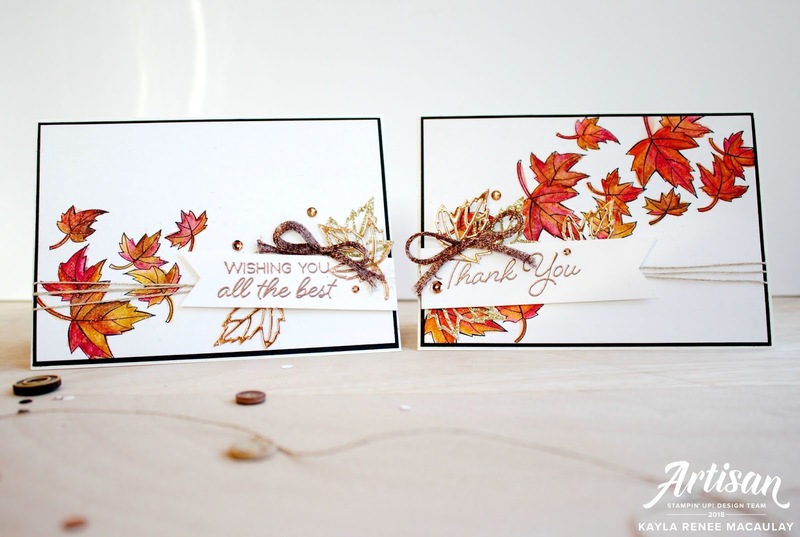 I also used the leaves stamp to stamp and watercolour some more leaves using the stamp. Then I added one of the Stitched Labels die cuts as a bit of a layer. I finished off the page with some extra embellishments including Vanilla Lace, Corrugated Elements, True Gentleman Buttons, Leaves Trinkets, Binder Clips and some stamps from the Lined Alphabet Stamp Set which I embossed in gold and watercolored with the new pencils and added the 'Be Your Own Kind of Beautiful' embossed in copper which is from the Artfully Folded Stamp Set. For my first attempt back at scrapbooking in a while, I am pretty happy with how it turned out and will definitely be getting into scrapbooking more often! Here's a close up of the page where you can see a little closer the Autumn colours that I coloured the title with. I used a mixture of Rich Razzleberry, Pumpkin Pie, Cajun Craze, Cherry Cobbler and Crushed Curry and I then watercolored them. What really helped with this is embossing the alphabet in gold which helped keep the colours in the line when working with water. In this close up of the page you can see that I have added some Copper Metallic Thread for some added embellishment. I have also accented my buttons by threading some Linen Thread through them and adhered to the page with a glue dot. I added some layers underneath the photo which was some Basic Black A4 Cardstock and a layer of some Tropical Escape 6x6 Designer Series Paper. 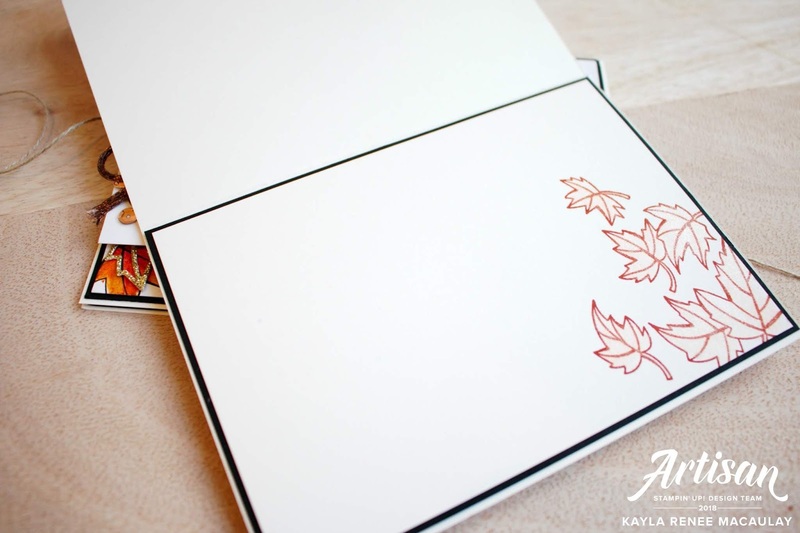 I hope this has inspired you to get some seasonal pictures out and get scrapbooking! I couldn't stop at just the scrapbooking page and so decided to make some coordinating cards. I really LOVE the leaves in the stamp set and so got set stamping them with Staz On Black on some Shimmery White Cardstock. I then watercolored these images with a mixture of the warm tones in the Watercolor pencils. I blended the colours with some Aqua Painters and then finished them off with a coating of Clear Wink of Stella which made them beautiful and shimmery! I accented the cards with some sequins from the Metallic Sequin Assortment and some Copper Trim. 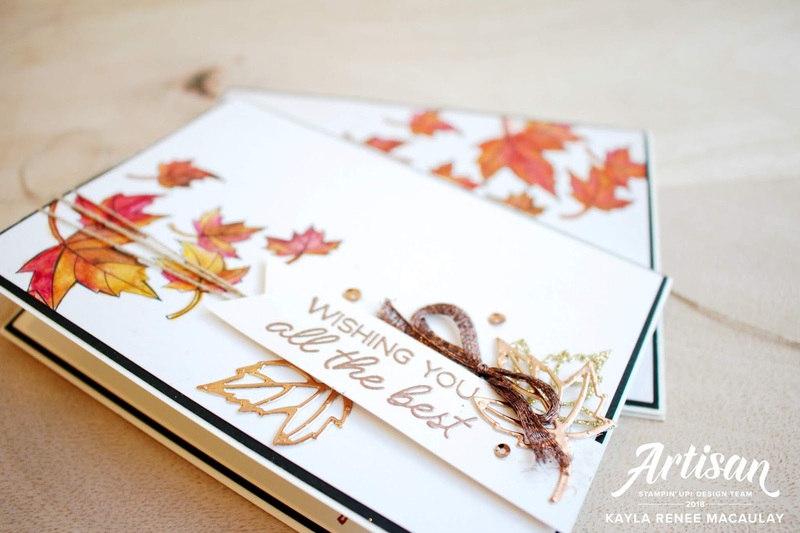 I added some Linen Thread and some Copper Foil and Gold Glimmer die cut leaves from the coordinating dies with the Blended Seasons bundle. Here's a bit of a close up which shows how I have embossed the sentiments with Copper embossing powder. 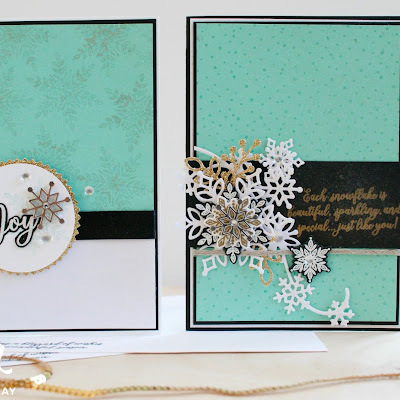 The fonts in these sentiments are just gorgeous and make a big statement. I am a huge fan of pretty fonts, especially when they are mixed fonts in one sentiment! I have used a small matt of Basic Black on my cards to finish it off. To finish off my cards I have stamped on the inside with the coordinating leaf stamp which I have stamped in Cajun Craze and while it was still drying I coloured the image in with the Clear Wink of Stella which blended the colour a little bit and added some shine and sparkle! Here's a look at the gorgeous products that you can order in this limited time promotion. You can order the stamps or dies on their own or as part of a bundle and receive the 10% discount and you can also order the brand new colours in the Watercolour Pencils. These are ten new colours that are a great addition to the colours we already have available in our pencils. Definitely a must have in your crafting stash and perfect for colouring so many different stamp sets we have available in our catalogue. Don't forget these products are a limited time offer and only available while stocks last, so get your order in so you don't miss out! 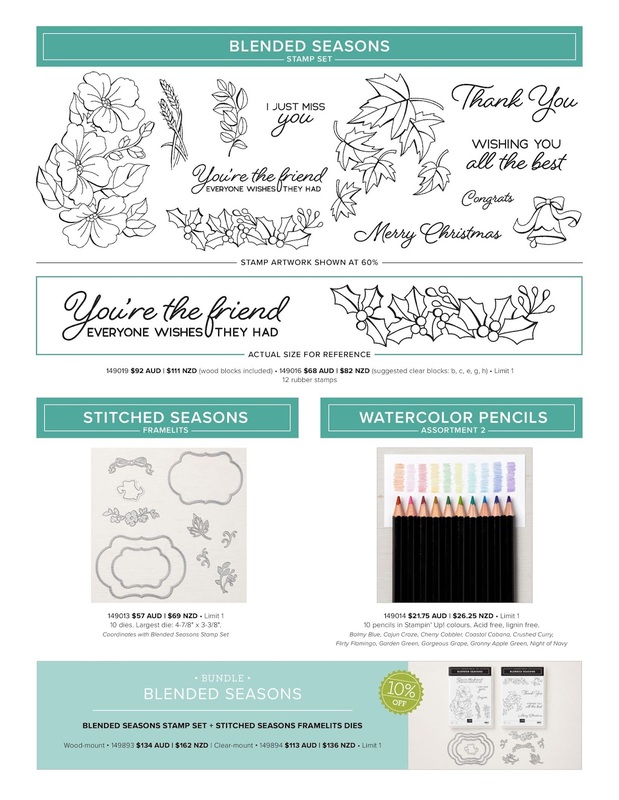 They are perfect for crafting every season, including Christmas!